Located in the state of Gujarat, Ahmedabad might not be the first Indian city that pops into your head when you start planning a trip to the subcontinent — but that doesn’t mean it should be overlooked. In fact, it really shouldn’t. Although the city may feel overwhelming at first, stick around and you’ll be rewarded with fantastic street food (much of it vegetarian), an array of architecture (from ancient to cutting edge), museums, and the Sabarmati Ashram — Gandhi’s former headquarters. Should you decide to add Ahmedabad to your travel list, here’s everything you’ll need to know once you’re there. As is often the case in India, opting for a prepaid taxi to get into the city from the airport is your most efficient option. You can expect to pay around INR 200 to 300 for the 10-kilometre journey to the city centre. To reach most destinations in the city, buses run by the Ahmedabad Municipal Transport Service (AMTS) are the most reliable option. A pay-per-ride fare will cost you a minimum of INR 5, with the maximum fare being INR 30. Another newer city bus service, run by Ahmedabad Janmarg Limited (AJL), is the Bus Rapid Transit System (BRTS). The fares are slightly higher than AMTS buses, but the service is known to be faster. In addition to buses, autorickshaws can be spotted everywhere in the streets. These are always cheaper than taxis, but pricier than AMTS or BRTS buses if you’re travelling more than three kilometres. Agree for the fare before getting in, or else you’re likely to be overcharged. One of the most popular attractions in Ahmedabad (and rightly so) is Gandhi’s Sabarmati Ashram, headquarters of Gandhi from 1917 to 1930 and the spot that served as one of the main centres of the Indian freedom struggle during that time. The goal of the ashram is twofold: to preserve the history of Gandhi and the freedom struggle, and promote and educate people in the philosophies and teachings of Gandhi. The Gandhi Memorial Museum is also on site. 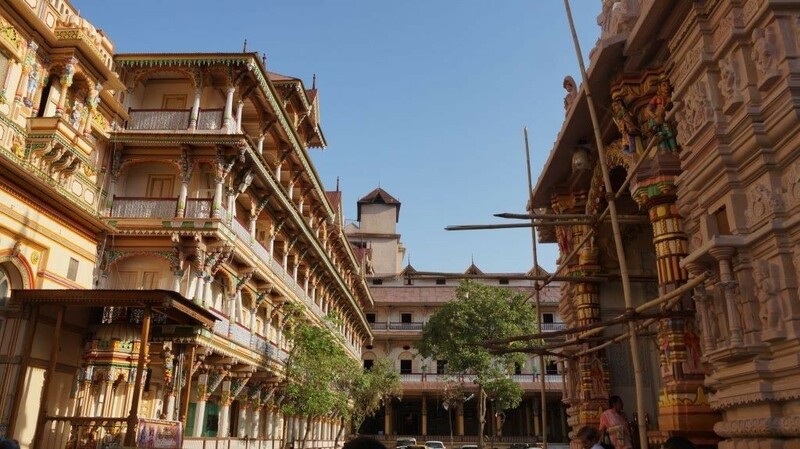 The Calico Museum of Textiles is well worth a visit because it holds one of the world’s most complete collections of antique Indian textiles, all handmade and some up to 500 years old. Here you’ll find items ranging from saris and tapestries, to royal garments and tribal costumes. The comprehensive museum also showcases different examples of needlework from around the world and various weaving and dyeing techniques. If you plan to visit, there’s only one tour a day which you need to sign up for in advance, either on the website or by phone. Manek Chowk is the place to be for both shopping and eating, depending on when you visit. The multipurpose square near the city centre is a vegetable market in the morning and then turns into India’s second largest jewellery market in the afternoon. At night however, Manek Chowk turns into the a massive street food market that starts up at 8pm and runs until around 1am. If you’re looking to tuck into some of the city’s best street food, this is the place to do it (seriously, bring your appetite). You’ll be able to fill up on everything from masala dosa to pav bhaji (vegetable curry served with a bun that’s been fried in butter). Jama Masjid (Friday Mosque) is known as one of India’s most beautiful mosques. The ancient structure, built in 1423, is a blend of Hindu and Muslim architecture and was built from materials taken from demolished Hindu and Jain temples. Anyone looking for a respite from being in the city can head to Kankaria Lake, which was constructed in 1451. You can head here to simply wander the lakefront promenade for a refreshing break from traffic, but the area is also packed with other attractions and activities — so much so that you could spend a whole day at the lake and not get bored. Go on a balloon safari or a Segway tour, play some mini golf or try your hand at archery, go on a boat ride or check out the butterfly garden. You get the idea. There’s a ton to see and do here. Hang on tight as you ride through the streets of ancient Ahmedabad! You’ll see spectacular temples, taste soothing masala chai, wander fabulous bazaars, and dig into an authentic local breakfast — all before midday! We couldn’t cram more into this total Ahmedabad adventure if we tried. 2 States, a love story about two people from very different Indian cultures, and Kai Po Che!, about three friends who decide to train India’s up-and-coming cricket stars, are two movies to watch to get you in the mood for Ahmedabad. Listen to some traditional folk music of the state of Gujarat before your trip to Ahmedabad. Read up on Ahmedabad before you go by picking up copies of Ahmedabad: City with a Past by Esther David and Ahmedabad: A City in the World by Amrita Shah. If you have any questions about Urban Adventures in Ahmedabad, feel free to contact us through email at info@ahmedabadurbanadventures.com, and follow us on Facebook for more information and travel inspiration.